We all have things we have to do and have to start somewhere and more often than not have a task list as long as wallpaper. Maybe a project, a deadline, writing a blog, making that phone call, the dreaded uncomfortable conversation, yet we put it off. We do everything and anything to not do that one thing we should be doing, we procrastinate…sound familiar? Sometimes it is just the getting started that is the problem and once we have begun to attempt the dreaded task, things gather momentum and we wonder why we ever worried and job done, hey presto, a big tick. Mission complete. We all have those little voices in our heads. The internal voice that we listen to and often, do as it says, more often we do not even realize we are paying attention to what is being said. These internal invisible voices can speak to us in the most awful ways. They can be rude, degrading and be-little us in a few words. They help us create barriers for our own success. They talk, we listen and when they present themselves this can stop us fulfilling our objectives. We can take that opportunity to do whatever else we can to stop us from actually completing the one task that would really lighten the load or ease our stress. Imagine how it would be If we managed to not stop listening to those negative little mind conversations but actually turned those conversations into positive ones. Conversations that help you pull on our big brave pants and go for ‘it’ (It being, that much-needed project, phonecall, conversation, task etc) the outcome is far better than we imagine. We are able to manage, to achieve and feel rather smug, sticking two fingers up to the negative mindless chatter and giving a high five to our positive inner munchkin. Your inner munchkin is there to protect you, to make sure you are safe. You may have heard the saying fight or flight. Our in-built fight or flight mechanism that stems way back to when time began is there to protect us. To stop us being eaten, our basic survival instincts were fight and defeat that saber toothed tiger or flight…run like hell, before he makes us a main course! Of course, our lives have evolved and the saber toothed tiger sadly a long gone memory but the principle is the same and can sometimes get carried away. So, how about kicking that negative inner munchkin into touch and tackling those tasks you really need to get done? How? Take a minute and completely stop for just a moment. Take some quiet time and shake hands with your inner munchkin. You can do it now, reading this. Sit quietly and just be, your brain may be thinking a million things. Let the thoughts calm, concentrate on your breathing. Notice how your chest rises and falls as you breath, Slow and steady, let your shoulders drop and relax. Just tell yourself its ok to be, it’s ok to be calm and it is great being you. Tell yourself I am unique and have a bucket load of skills, I am great. I can do (whatever it is you need to do). Trick your brain, by saying “this task is simple, it is easy, it is fun, we can do this” (Insert smile here) Just breathe. When you feel you have taken enough time. Say thank you to your munchkin and carry on with your day. It can take time and practice, it really is worth it though. 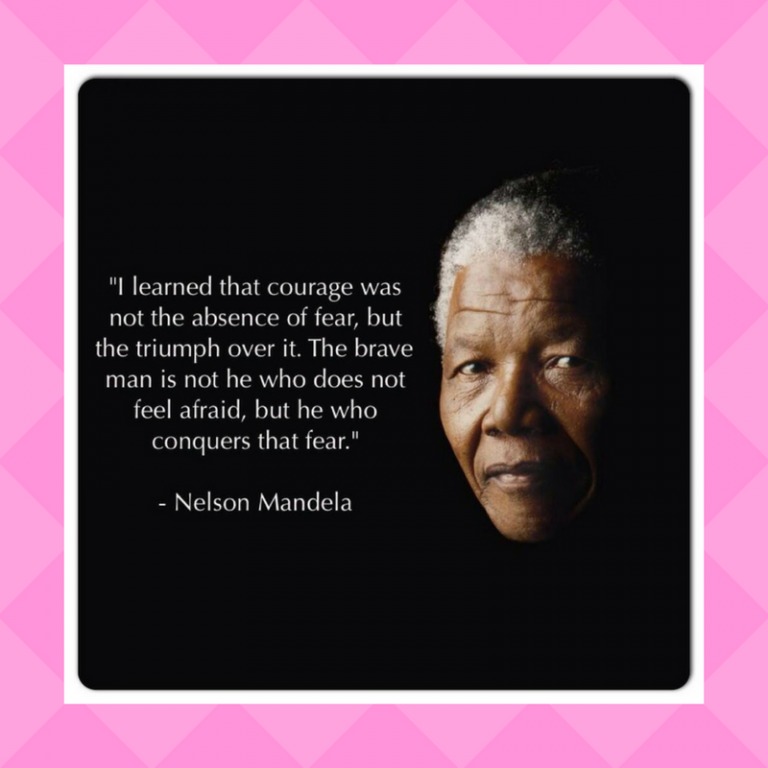 When I started this blog, I wanted a quote to use and I loved this one “I learned that courage was not the absence of fear, but the triumph over it. The brave man is not he who does not feel afraid, but he who conquers that fear. Nelson Mandela. How great was Nelson Mandela…that’s another blog!! I could just imagine you talking me through the meditation…”this task is simple, it is easy, it is fun, we can do this”…such a great phrase. I’ve started stacking my habits – for example; putting my workout clothes on first thing in the morning then when I get back from the school run I get straight to an exercise DVD or yoga, then I have a healthy breakfast as a reward. It’s much easier to do some exercise if I’m already wearing the right things, otherwise I may not be inclined to get changed etc. I still have a way to go on other areas where I procrastinate a lot but if I’ve cracked it in one area I’m sure I can do it in another – positive thinking is certainly key! This is simple, this is easy, this is fun, is so simple yet it delivers an amazing amount of punch. I love the stacking habits idea 🙂 I am not sure you procrastinate a lot?? Positive thinking is definitely the key and a little bit of time management technique thrown in for good measure! Loved to inspire you, the feeling is mutual!! You go girl! So very proud of you.